Gormless caveman Dug (Redmayne) and his clan are menaced by Bronze Age invader Lord Nooth (Hiddleston), until twinkle-toed defector Goona (Williams) joins them to help them unite. Deliciously daft prehistoric fun from Park and his team on top form, with winning human touches, plenty of sight gags and painful puns. For the first time since his Academy Award-winning Wallace & Gromit: The Curse of the Were-Rabbit, Nick Park returns to the director’s chair to bring us his feature-length take on the outrageous antics of our earliest ancestors. Having outlined the project as far back as 2007, and in production since 2015, Early Man brings lovable cavemen and women to the Aardman stable of sheep, chickens and madcap inventors with canine sidekicks. 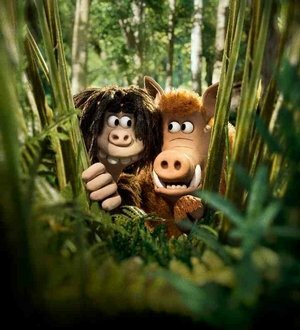 Set at the dawn of time, when prehistoric creatures and woolly mammoths roamed the earth, Early Man tells the story of how plucky caveman Dug, along with new pal Goona and pet sidekick Hognob, unites his tribe against Lord Nooth and his dastardly plans. Nooth and his Bronze Age followers move in on Dug’s tribal homeland and it takes a mighty effort from the Stone Age team to dislodge them by means of a challenge on their home turf. Is Dug mad to think they can beat them at their own game? With an unforgettable cast of hilarious new characters, this is another series of spectacular verbal and visual gags in the Aardman style. Added to which we have the voice talents of Eddie Redmayne, Tom Hiddleston, Timothy Spall, Miriam Margolyes, Richard Ayoade and Rob Brydon and a hugely entertaining – if rather novel – slice of ancient history. As one character asks, “What strange magic is this?”. The answer’s very simple. It’s Aardman magic.